I want to point out a couple of problems with the CPM. First and foremost, it’s a single number. This aspect causes a couple of secondary problems that put the buyers at risk. One of the big ones is that there’s no guarantee that the ad will actually show on the page. Steps have been taken to address this by several companies. The result of this problem is a topic near and dear to my heart: discrepancy. I spent the better part of two years battling discrepancy. I worked on tracking software, forensic scripts and put in more firebug time than I cared for. Someone finally put in a secondary notification to allow for discrepancy tracking at the impression level. Even with that, the problem still exists. The CPM, a singular number, can’t help address this problem. When the buyer wins the impression, they’re stuck with it no matter what happens. 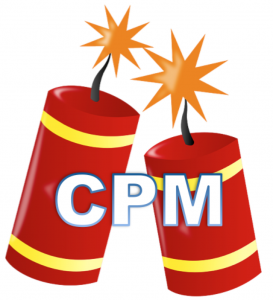 The singular nature of the CPM has another secondary problem: Auto-refresh. Some publishers refresh the page or the ads after a fixed amount of time. This could be as little as 30 seconds. Sometimes they’ll refresh the ad on a mouse gesture after a fixed amount of time. There’s no data in the bid request that tells the buyer how long the ad will show. Often times, the selling platform isn’t even aware of the auto-refresh. But there it is, frequently short-changing the buyer. I have a proposition for you and it’s not a totally original. There have been calls for this notion before. You can take it or leave it; I think you should take it. Let’s kill the CPM and replace it with several CPXs. I’ve highlighted two or three problems where a singular number is not doing the industry any favors. To solve just those problems I propose we use three numbers. Let’s have a number for the opportunity to show an ad. This number is charged to the buyer when they win the auction, regardless of what happens afterward. I’ve decided to call it Cost Per Opportunity (CPO). This won’t replace the CPM in the auction model. In fact, having three numbers replacing the singular CPM will add some complexity to the auction. I’m afraid that the supply side stacks will have to do some work. Those guys love mathematical modeling though. Right, Neal? Another number will charge the buyer when their ad comes into view. That means that above and below the fold are less relevant as signals in the bid stream. To track this number the exchanges and supply side platforms will have to track the position of the ad and develop some tech to charge the buyer the right price. Presumably this Cost Per View (CPV) will come across with the rest of the bid data from the buy side. My third proposed number is a fun one because it works quite well with display media as well as video. The Cost Per Duration (CPD) charges the buyer on a per time increment basis. Consider a scenario where the buyer is charged in five-second increments when their ad is in view. The CPD might cap out after 60 seconds. Imagine bids coming across the wire with these three numbers instead of a CPM. This would force the sell-side to pay close attention to how each publisher’s ad unit performs against these numbers. The auction system will have to be reconsidered. How are we to use a simple second price auction model with three prices in each bid for different aspects of the available impression? Again, this is a solvable problem. How long was a truly second price auction going to last anyway? For the publishers, the incentive to auto-refresh below a 60 second threshold is greatly reduced. They’d get paid while the ad is showing and the risk to the buyer goes away if the publisher still thinks the a short refresh rate is worthwhile. Below the fold positions would no longer be risky to buy. Buyers simply pay the opportunity cost and only get additional charges when their ad comes into view. Publishers won’t have to wipe out their BTF slots or develop fancy ad serving to draw in new ads when one of those positions come into view. Discrepancy becomes a non-issue. Opportunity pricing eliminates it. Hallelujah! We don’t have to stop at these three prices. Once the software is adjusted to deal with an array of prices we could add new CPXs to deal with other problems that I haven’t considered in this post. I know this sounds like a lot of work. Every company will have to adjust their software, stats and minds to get this to work. Without considering this solution, we’ll probably continue to see discrepancy and view-ability in pitch decks for years to come, but we can move this industry. We reshaped it with Real-Time Bidding. There’s no reason we can’t do this.